Okay, finished a dragon…the pic on the left shows the colors better, but I wanted to show off the wings too! Now he needs a name… ideas? Mine were all lame, like Draco or Mean Greenie or That Thing That Gave Me Carpal Tunnel. I love it, especially the eyes! 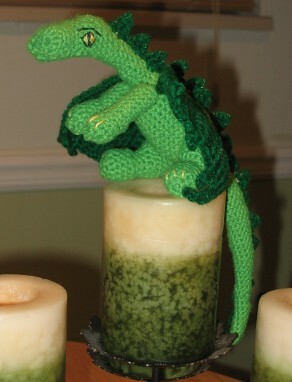 “Elliot ” the dragon in the movie “Petes Dragon”. Your dragons wings are quite a bit larger than Elliot’s but that face is something else. Very cute, for a dragon 😉 . Name i’ll go with Craftycarolinagirl, Puff and that think that gave me carpal tunnel, are bouth very cute for this dragon! I’m drawing a blank on names, but just wanted to say he looks great – especially the eyes! How about sage? he is so sweet! According to my 6 year old son Sam FIRESTARTER!!! obviously 😉 We both think he is adorable. Love the Dragon. 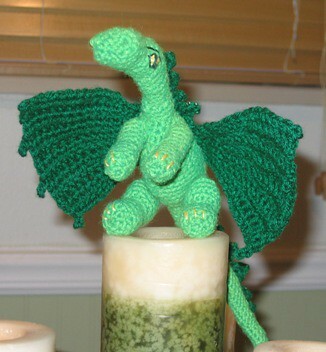 I’m making a different dragon for my boyfriend but the dragon pattern I have doesn’t include wings. I love the wings on your dragon. Do u share your patterns? Glad you liked it, happy crafting! I can’t seem to figure out the wings. The claws are not turning out. They appear to be blended in the pattern instead of hanging off the ends as in the pictures. This is making the wings look really goofy. Can you please help me? I would greatly appreciate it. If you need a name you could just scramble around the letters in a word. So for example take the word fire and you could name the dragon Erif. Greek name derived from the word hydor, meaning “water.” In mythology, this is the name of a many-headed water dragon killed by Hercules. By the way that’s a piece of art you have there!.. Dralic, pandria,flame,cole,ember,or spark. Idk if u wanted girl or boy names so I gave u a list. I did a little resurch and pandria means chief dragon… the others just poped in to my head. Well good luck!! !